November 28, 2017 - KS Wild visits the footprint of the Abney Fire within the Miller Complex of 2017 fire season and documents fire effects. December 4, 2017- Scoping Notice posted on the Klamath National Forest Seiad Horse Project website announcing the timber sale. December 29, 2017 - KS Wild provides timely substantive scoping comments urging the Klamath National Forest to focus fuel treatments around homes and communities and hundreds of commenters ask the agency to protect old growth reserves on the Siskiyou Crest. Feb 28, 2018 - Klamath National Forest announces a public field trip to the timber sale. April 2, 2018 - Klamath National Forest publishes an Environmental Assessment on the timber sale and begins the 30-day public comment period. April 11, 2018 - The public field trip to the project area is canceled due to weather. 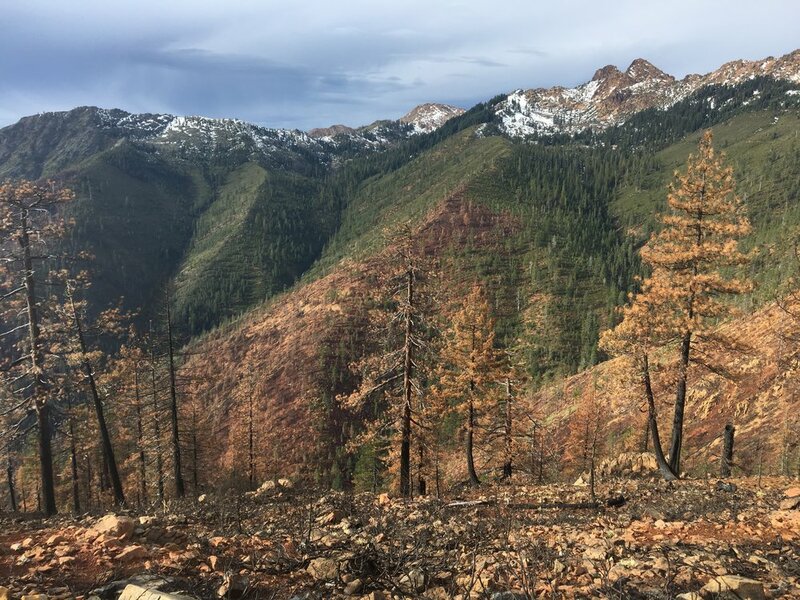 April 13, 2018 - KS Wild sends and ACTION ALERT to members asking the Klamath National Forest to work with local communities, tribal interests and stakeholders to restore, rather than clearcut, backcountry, post-fire, Late-Successional Reserve forests in the Seiad-Horse timber sale. May 2, 2018 - KS Wild submits timely substantive comments on the April 2018 Draft Environmental Assessment. Community members again send comments on their own behalf speaking to the values of the Siskiyou Crest for wildlife and watersheds. May 23, 2018 - Rescheduled public field trip takes place. KS Wild and community members participate. May 24, 2018 - KS Wild returns to groundtruth site specific units proposed for clearcutting. June 5, 2018 - KS Wild updates their blog from their ground truthing field trip findings. June 7, 2018 - The project’s Environmental Assessment is posted on Klamath National Forest project page online and begins a 30-day comment period. June 8, 2018 - The Draft Decision Record and Finding Of No Significant Impact are posted in local newspaper, The Siskiyou Daily. A 30-day public comment period begins. July 19, 2018 - KS Wild files a timely administrative objection to the Draft Decision and Finding of No Significant Impact. August 27, 2018 - KS Wild and Klamath National Forest have an objection resolution meeting. Regional Forest Service Officials order Klamath National Forest to do supplemental analysis on their Environmental Assessment for the project. The Klamath National forest refuses to budge from its clearcutting plans. September 28, 2018 - The Final Decision Record and 2nd Revised-Environmental Assessment required by the Regional Office is posted online. Klamath National Forest, KS Wild Staff, and community gather within unit proposed for clearcutting on a public field tour of the timber sale. Two old growth trees slated for clearcutting in the Seiad Horse timber sale. October 4, 2018 - KS Wild returns again to the timber sale to further groundtruth the proposed backcountry clearcutting. October 16, 2018 - KS Wild, Environmental Protection Information Center, and Klamath Forest Alliance file a legal complaint seeking a preliminary injunction before logging can occur. October 29, 2018- The Copper Timber Sale is offered by Klamath National Forest - No bids are received. October 31, 2018 - The Pitchfork Timber Sale is offered by Klamath National Forest - No bids are received. November 11, 2018- KS Wild and co-plaintiffs file Motion for Temporary Restraining Order to halt logging operations from beginning. November 19, 2018- Logging is scheduled to occur. November 20, 2018 - American Forest Resources Council files a motion to intervene as an interested party in the lawsuit. November 24, 2018 - KS Wild heads out to the project are to see if wet weather conditions influenced the start of logging. December 10, 2018 - Klamath National Forest file a response brief objecting to the temporary restraining order.